Dozens of migrants have been stranded on the Tunisian gas tanker Sarost 5 for 12 days as Tunisia refuses to disembark them at one of its ports. The captain insisted he doesn't want any outside help, only a solution. The migrants, who had set off from Libya, were picked up on July 13 in the Maltese search-and-rescue zone by the supply vessel Sarost 5. They were later taken to Tunisian waters, where they have been blocked by the authorities there, dpa reports. Also read: Migrants left stranded off Tunisian coast: "We only eat a piece of bread and one egg per day"
So far, neither Malta, Italy nor Tunisia has given the Sarost 5 permission to enter their ports. The ship is currently off the coast of Zarzis in the south of Tunisia waiting for authorization to reach the mainland. The captain Ali Hagdi told Spanish news agency EFE he will refuse „all aid from outside“ to forgo a standoff at high sea and resist the government’s attempts to stop their entry into Tunisian territory. On Tuesday, the captain finally agreed to accept the arrival of ships with food and medications, as there is hardly any food left. Doctors of the Red Cross will travel to the Sarost 5 to carry out medical checks on the migrants, EFE reports. „We started this together, we will finish it together“, Hagdi said about his team. 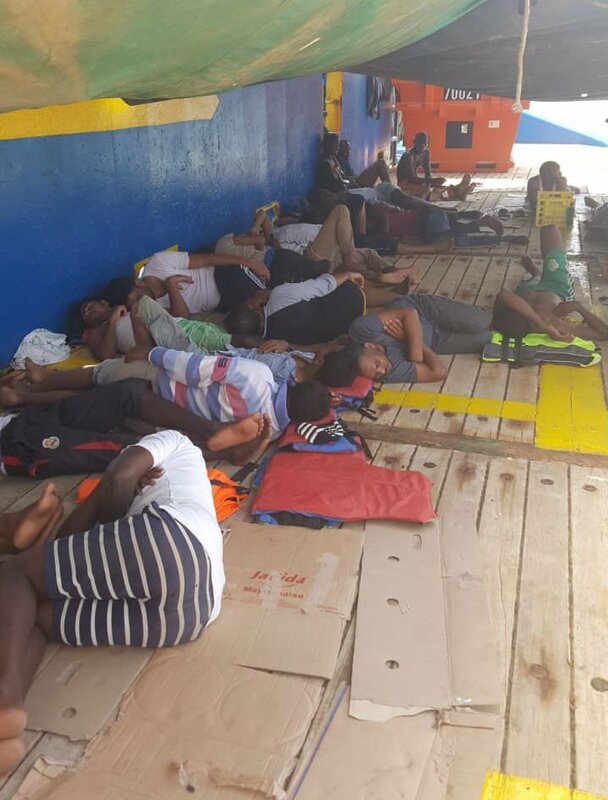 According to the Tunisian Red Cross, the 40 rescued migrants are between 17 and 36 years old, including two pregnant women, and come from Egypt, Bangladesh, Cameroon, Senegal, Guinea, Cote d’Ivoire and Sierra Leone. The NGO „Watch the Med“ has published several video testimonies of migrants onboard the Sarost 5.